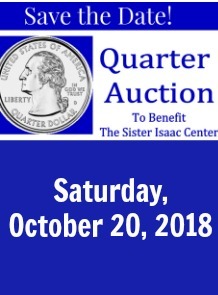 We need your help in planning the “Quarter Auction” fundraiser for the Sister Isaac Center on Saturday, October 20, 2018. 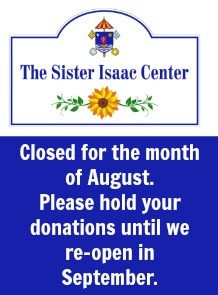 This year’s event will be held in the Upper Room 1871 in the Tileston Center. This is the 8th year for this event and it had grown in popularity and profits each year. Let’s keep it growing! A “Quarter Auction” fundraiser is a type of auction where people bid on items using quarters instead of larger sums of money. This enables people to win valuable items for as little as 25 cents, 50 cents, 75 cents or a dollar! The auction items will be offered based on their value in $10 increments. For example, an item valued at $20-25 will be auctioned for a 50 cent bid, a $10-15 item might be valued at just a quarter! Auction bidders pre-purchase tickets for $5.00 that they will turn in at the door for a numbered paddle to do their bidding! Paddles will be $7.00 at the door and additional paddles can be purchased to increase your chances of winning! … if you or any friends or family members are home-based vendors who might be interested in donating goods toward the auction for the opportunity to network with our attendees and set-up a table free of charge at the event. (i.e. Pampered Chef, Tupperware, Mary-Kay) We will offer these opportunities on a first-come first-serve basis as we will only be able to have one representative from any business attend. Returning vendors will receive priority. …if you or any friends or family members have service, retail or other types of businesses that may be willing to make a donation to the auction. Gift certificates, free passes for services or events are great items! Handmade crafts and gifts are welcome donations. …if you will help by pre-selling tickets! We will begin selling tickets at the end of September, about 20 days before the event. …if you would like to help the day of the event! We will need people to take tickets, issue paddles, make change and many other duties! The Catholic Daughters provide refreshments and lunch items at the event. Please contact JoAnne Shadroui (jmsspotty@aol.com) or Claudia Rossi (iclaudia.rossi224@gmail.com) if you are interested in helping in that area the day of the auction.